On October 17, 2017, Electronic Arts shuttered Visceral Games and canned its untitled Star Wars game. Project Ragtag, as it was known in-house, was no more. EA executive vice president Patrick Soderlund wrote in a statement that there would be a "pivot" in the game's design, leading many to cry foul - EA has a history of shutting down player-favorite studios, so many assumed the single-player adventure had been cynically tossed to make way for something that would push microtransactions and loot boxes. The earliest stumbling block Ragtag faced was what direction and vision it would take. While most of the studio was working on Battlefield: Hardline, another team within Visceral prototyped a pirate game codenamed Jamaica. According to Kotaku's report, when EA made a deal with Disney to be the sole publisher of Star Wars games, it scrapped Jamaica and tasked Visceral with creating a Star Wars project. Visceral kept many of Jamaica's ideas, but shifted the tone so it would work within the Star Wars universe. Instead of pirates, you'd play as a smuggler, like Han Solo. "It was going to be some hybrid between a linear action shooter, where if you’re on the ground it’s Tomb Raider-like, but then in space it’s gonna be Black Flag," one former Visceral worker told Kotaku. The codename for this new vision was Yuma. Yuma didn’t last long. Some time after former Uncharted and Legacy of Kain series director Amy Hennig joined Visceral, she coalesced Yuma's ideas into a more linear, story-driven game. This was the beginning of Ragtag. 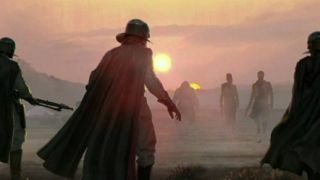 According to Kotaku's sources, the game's plot would have followed an original character named Dodger as he went on a heist-style adventure with multiple companions between the events of Star Wars: A New Hope and Star Wars: The Empire Strikes Back. But Visceral didn't have the manpower. With half of the studio working on Battlefield: Hardline DLC, there were allegedly only 30 or so people working on Ragtag when it entered pre-production. By comparison, Uncharted 4 - from Hennig's former home, Naughty Dog - had a team numbering into the 200 range. The studio was also working with unfamiliar tech. EA mandated several years ago that all of its games be built using the Frostbite engine, but that was a set of tools developed by DICE to make first-person shooters. Much like how BioWare had to build components of a story-heavy, third-person action game from scratch for Mass Effect: Andromeda, Visceral had to the same. It would seem in both cases that this was a major issue in getting the respective games off the ground. Ex-Visceral staff told Kotaku that there was tension between the studio and its parent company, EA. "EA would get obsessed with market research and start asking people what’s important to them about Star Wars," said one. "You’d get, 'Oh, the Force, lightsabers, the usual Jedi continuum.' They’re hyper focused on that stuff, and it’d be a topic of conversation in every pitch meeting." For Hennig, who allegedly wanted to make a game about space pirates that didn't touch on midichlorians or the Jedi or characters from the films, that was a problem. The staff and structure at Visceral was also new to Hennig. Some developers who worked on Ragtag said that it felt like she didn't trust them, and that she was under too much pressure, asked to do too much, spread too thin, to work effectively. Others said that EA mandated a Metacritic score of 90 or higher, and pushed the team to add features so it would hit that goal. It didn't help when, at the end of 2016, EA called in its EA Vancouver studio to effectively take the reigns (EA Vancouver is now leading development on a new project that will use some of Ragtag's assets). With tensions high, technical setbacks aplenty, multiple workforces, and conflicting visions, Ragtag fell behind. What did get created was deemed too unoriginal. As one ex-Visceral employee said, "Every single one of those levels you could hold up a video of Uncharted beside it, and you could literally say, 'OK, this part is like this part from Uncharted.'" When the call came down for Visceral to be shuttered, one employee referred to it as "a mercy killing." When Kotaku asked Soderlund about the game's cancellation in light of these anecdotes and insights, he said: "Making games is hard. That’s not new, but it bears saying again because if anything, it’s getting more complex." Soderlund also addressed the notion that EA killed Ragtag because it was a single-player game, saying, "This truly isn’t about the death of single-player games - I love single-player, by the way - or story and character-driven games. Storytelling has always been part of who we are, and single-player games will of course continue. This also isn’t about needing a game that monetizes in a certain way. Those are both important topics, but that’s not what this is. At the end of the day, this was a creative decision." "Our job is to give people a deep enough experience and story, and it’s also to push the boundaries forward. We just didn’t think we were getting it quite right."